MIDDLEBORO, Mass. – At the end of Canton’s last game, head coach Ryan Gordy said his team needed to get more players involved on the offensive end. Fast forward nine days and the Bulldogs answered the call. By the end of the first quarter, six players had a field goal and by the final buzzer, nine players found their way onto the scoresheet in a dominating 84-44 win over Middleboro. The Bulldogs forced seven turnovers in the first quarter, relying on its 1-3-1 press to make the Sachems uncomfortable. Canton raced out to a 12-3 lead through the first five minutes but Middleboro kept it close by the quarter’s end, down just 14-9 to the Bulldogs. Canton’s bench provided a spark in the second quarter. First, it was senior Eric Olshaker who rattled off an 8-0 run of his own. He pulled in a pair of rebounds before hitting two free throws. He pulled in an offensive board and converted the put back – plus the harm – for a conventional three point play. He then hauled in a Middleboro miss on one end and came down the other end and hit a three to put Canton up 22-9. Not to be outdone, junior Austin Maffie went on a tear of his own. A rebound on the defensive end led to a layup on the other end. Maffie then came away with a steal at midcourt in Canton’s 1-3-1 for an easy bucket and then drained a three after Jake Verille pick-pocketed a Sachem the next possession to put Canton up 31-9. Maffie put an end to a 5-0 run from Middleboro with another three from the corner and then hit another trey coming off a screen in the final seconds off a pass from Ryan Lentol. Maffie recorded an impressive 16 of his career-high 23 points in the second quarter. Olshaker (seven rebounds) had eight of his 13 in the frame. 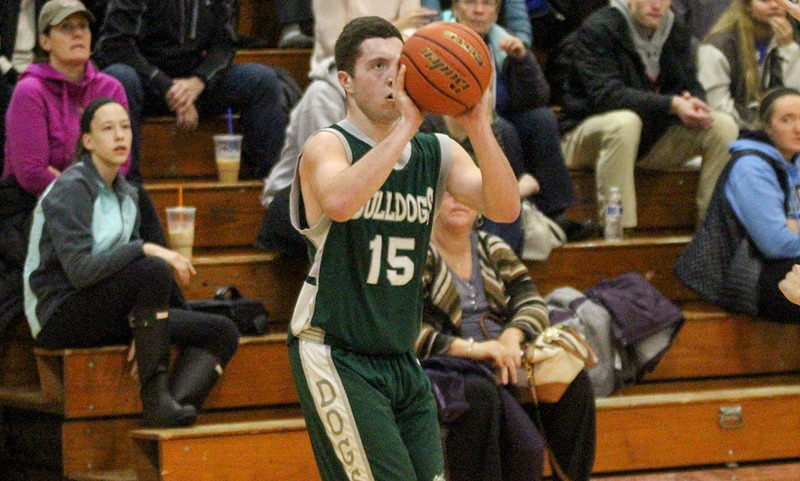 The contributions from Olshaker and Maffie – who combined for 24 of the Bulldogs’ 28 points in the second quarter – put Canton up 44-19 over the Sachems at the halftime break. Devin Foster (14 points, five assists, two steals) hit a three and added two more free throws to start the second half to extend Canton’s large lead. Tony Harris (14 points, four rebounds) came away with one his four steals and scored on the other end to put the Bulldogs up 49-19. Senior Brian Albert (eight points, five rebounds) scored four straight points, both on offensive rebound put backs to keep Canton’s big lead. “The execution level was high,” Gordy said. Canton shot 52% from the field and forced 22 turnovers. “I really thought our defense set the tone. We caused some turnovers early that led to some transition baskets for us. Sometimes it’s about making and missing shots and we were making shots tonight so that helps too. Canton finished with 10 three pointers, a 34-19 advantage on the glass and went 8/12 from the free throw line. Canton boys basketball (1-3) will host Archbishop Williams on January 3rd before getting into Davenport division play with a visit from North Attleboro on January 6th.